After: Eddie’s studio was treated to some absorptive wall panels, plus two free-standing gobos at the monitoring mirror points. 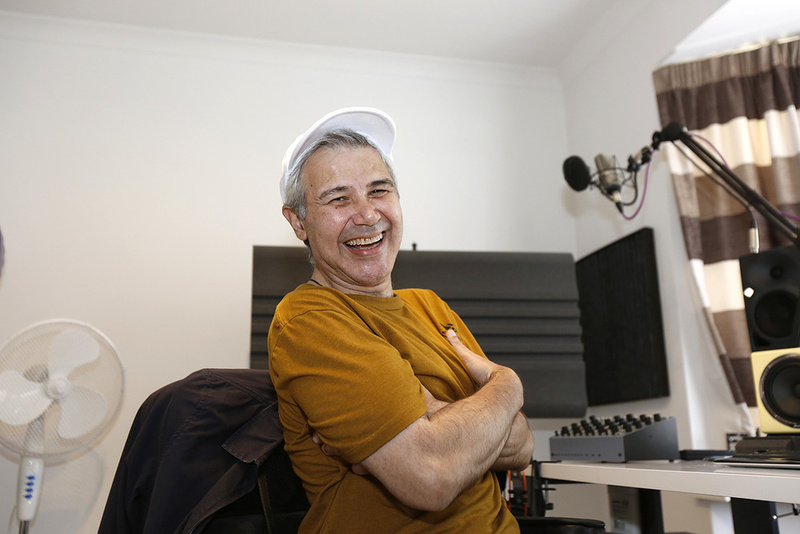 Regular readers may recognise Eddie Bazil as a frequent participant in the Sound On Sound forums, and indeed he has contributed many articles to the magazine over the years. He is also the man behind soundware companies Stretch That Note and Samplecraze. However, he suffered a major setback recently when his house was virtually destroyed in an electrical fire and, now that the rebuild is finally complete, he asked SOS to help him fix up a front room to serve as a studio space. 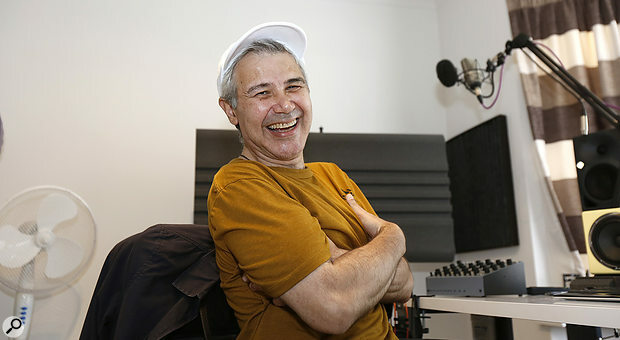 He told us he had a PC running Nuendo, a pair of Neumann KH120 monitors, and a Focusrite Forte interface, as well as a Novation keyboard, so he was able to make music again. However, the bare, painted-brick walls weren’t exactly conducive to accurate monitoring or for creating a space in which to record voice or acoustic instruments. 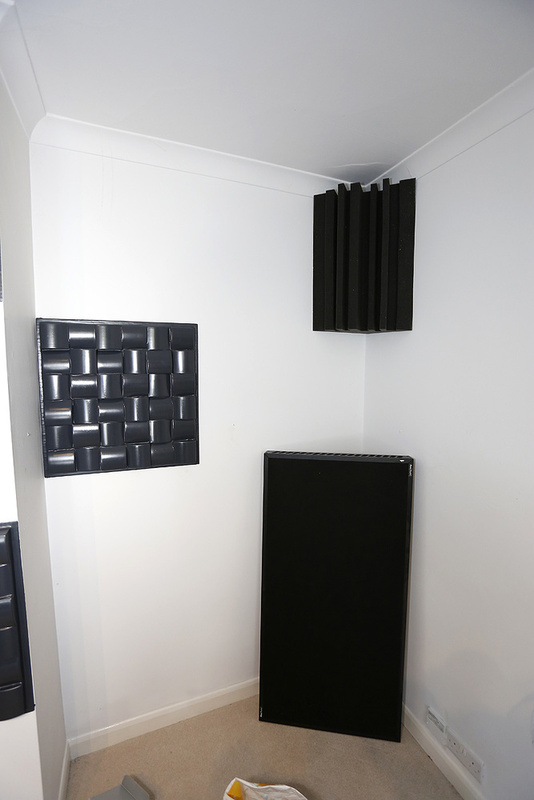 We were happy to accept the challenge but didn’t have much in the way of acoustic foam in stock, so we decided to try a different approach by using a combination of acoustics products that we had recently reviewed. The manufacturers kindly agreed to let us reuse the review components for a Studio SOS feature, so with my car literally loaded up to the roof with everything we could lay our hands on, we set off to High Wycombe. 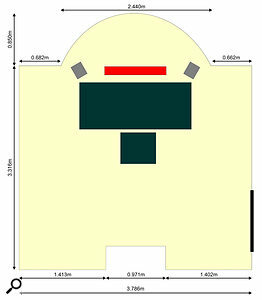 Room plan of Eddie's studio space.Eddie’s front room measures roughly 3.8 metres wide by 3.3 metres deep and 2.4 metres high, with a one-metre-wide chimney breast at the rear and a 2.5-metre-wide double-glazed bay window at the front. Eddie had fitted a carpet, but other than the desk for the computer keyboard, which was also home to a single Avantone speaker, there was very little else in the room. The two Neumann speakers were placed on tall hollow metal stands, and a very large flatscreen TV was mounted on a wheeled floor stand behind the desk to serve as the computer monitor. After accepting coffee and an excessive number of choc-chip HobNobs, Hugh checked that all the settings on the rear of the speakers were neutral, then played his test CD through the system, focusing on the track of low-frequency test tones to give us a good idea of where we might find problems at the bass end. Given that the room had solid walls all round, was not particularly large, and was dangerously close to being square, the bass end was much better than we feared it might be, and the main issues were pretty mild dips rather than excessive peaks. While a flat response is the ideal, dips are less obtrusive than peaks, and achieving a perfectly flat response in a domestic sized room is a big ask. Also, those Neumann monitors might be small but they don’t lack low end. Further up the spectrum, the room presented a noticeably ’splashy’ quality in the upper mid-range and the stereo imaging wasn’t as sharp and precise as it should have been with those monitors. So, we certainly needed to ‘dry up’ the sound of the room, and anything we could do to even out those bass dips, even slightly, would be a benefit. After unloading the car we had an impressive pile of boxes comprising an Aston Halo vocal screen, six Sound Momentum moulded diffusor panels, two EQ Acoustics foam gobos, two Real Traps, two Universal Acoustics foam corner traps, and a pair of lightweight Leggero Soundwave Squares 600 x 600mm panels. As the room was newly painted we hoped to fix up our treatment with the minimum disruption to the surface, though some glue and double-sided adhesive tape was needed for part of the job. Rather than use absorbers at the rear of the room, our idea was to instead use mainly diffusion. This can be problematic sometimes if the listening position is close to the diffusion panels, resulting in a phasey reflected sound quality, but in this case Eddie’s seat was almost two metres away, and initial experiments suggested it would work well. So three of the Sound Momentum diffusor panels were fitted to the chimney breast in a staggered pattern, with two more on the walls on either side of the chimney breast. These fix using a spongy double-sided tape around the edges, and although that probably puts up a fight if you need to take the panels down again, it is still likely to be less disruptive to the paintwork than a fully glued foam panel. The remaining Sound Momentum diffusor panel was fixed to the ceiling above the listening position where the adhesive tape held it very firmly to the new paintwork. This would help break up ceiling reflections from the monitors that might otherwise reach the listener. Diffusion works differently from sound absorbers as its purpose is to randomise the reflected energy rather than absorb it. It helps to keep the room sounding bright and lively, but without any discrete slap-back echos or a feeling of the room being over-damped. The studio’s rear wall was decorated with six Sound Momentum diffusor panels. The conventional absorbers we planned to use elsewhere would provide the necessary ‘drying up’, starting with two 600 x 1200mm Real Traps, which combine mineral wool with a membrane. We ended up leaning these across the rear corners of the room where they’d have some useful effect on the lower frequencies as well as the mids and highs — and without needing any glue or fixings. Eddie could always mount these higher on the walls later if he wanted. The two foam corner traps we had were fixed in the two upper rear corners — though there was no real alternative other than to use spray adhesive to mount those. 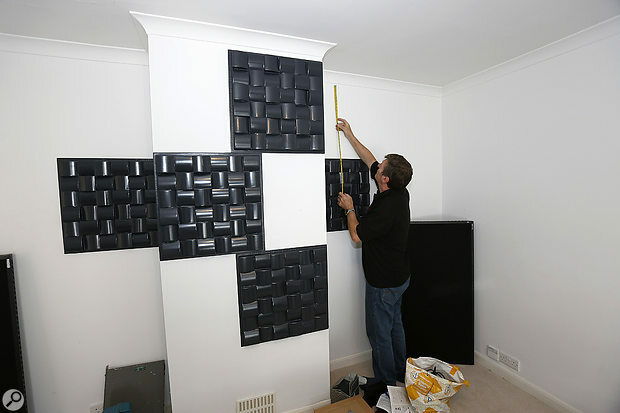 The Soundwave Squares are 600 x 600mm panels comprising a concertina of felt-like material supported in a cardboard frame. They work just like similarly sized foam panels but are less expensive and can also be used as free-standing screens if required, as they have pop-out cardboard stands on the rear. In this case though we used them as wall panels, fixing one either side of the bay window at head height, again using double-sided adhesive tape. To counter reflections from the side walls, which were probably going to be the most significant acoustic issue in Eddie’s room, we used a pair of EQ Acoustics foam gobos, but rather than glue them to the wall as would be the usual strategy with acoustic foam, we used them as intended, supported horizontally on mic stands. Obviously, there’s no real weight in these foam gobos so any low-cost mic stand will do: it doesn’t need a boom arm, doesn’t need to be heavy or strong, and a round base is probably more convenient than a tripod stand. The foam used for these gobos is a little firmer than that used in typical wall panels and, as well as being nicely shaped, has both horizontal and vertical slots cut into the rear face that simply grip onto a mic stand allowing the panels to be positioned anywhere in the room. Our thinking was that we could set these up in landscape mode around the mix position at head height and spaced maybe 300 to 400mm from the side walls. This would work nicely in reducing side-wall reflections when mixing and would also be more efficient at lower frequencies because of the spacing from the wall. The rear faces of the panels would also intercept some reflected sound, making them rather more effective than similarly sized wall-mounted panels. The room’s low end was tamed with the help of two Real Traps lent across the bottom corners of the rear of the room, and two Universal Acoustics corner traps, which were placed at the wall/ceiling tricorners. Additionally, when recording rather than mixing, these EQ Acoustics foam gobos could be redeployed to create a customisable recording environment around acoustic instruments or vocalists. This reconfigurable room treatment option was also supplemented with the Aston Halo screen, allowing a very effective vocal booth to be constructed quickly and easily using the Halo behind the mic, and the two EQ Acoustics foam gobos vertically behind and to the sides of the vocalist. With a satisfactory recording in the DAW, Eddie could then quickly reposition the foam gobos around the mix position. With all of our room treatment in place, the only area left untouched was the bay window, and if left uncovered the window glass in a curved bay can have the effect of focusing the reflections in one spot — which in this case would have been worryingly close to the mixing position. Eddie’s pragmatic and effective solution to this was simply to cover the windows with screens and close the curtains when working in the studio. Obviously the heavier the curtains the better, but what Eddie had worked well enough. However, to minimise the risk slightly, we also repositioned the monitor stands, pulling them a little further away from the bay window. This brought the monitors well in front of the TV screen (originally they were roughly level with the front of the screen), which would hopefully improve the stereo imaging by minimising any acoustic diffraction and reflection from the edge of the TV screen. Further listening tests showed a very marked improvement in stereo imaging, after which we did some further tweaking to the speaker positions, moving them even closer to the table with the aim of reducing the reflections from the desk surface, and also improve the direct-to-reflected sound ratio. We also optimised the toe-in angle of the speakers so that the tweeters were pointing directly at the engineer’s head position. Hugh noticed that although the stands were of good quality, they weren’t very stable on the carpet, despite being spiked at the base. Hugh suggested that Eddie invest in a couple of square concrete slabs from the nearest garden centre to provide a firm, level base on the carpet, and then place the stands on those slabs. It would also be worthwhile filling the hollow tube sections of the stands with kiln-dried sand or kitty-litter (unused!) to add to their mass and improve the damping, as hollow stands have a tendency to ring in their unfilled state. Finally, I had in my bag of bits a foam speaker support I’d made for a previous job by gluing a few Auralex MoPad pieces together, so I left that with Eddie to put under his Avantone Cube speaker to avoid unwanted vibrations through the table top. The final listening tests were very encouraging, with no glaring bass problems, much improved stereo imaging and a significantly drier, better focused overall sound. Eddie Bazil in his newly treated studio. 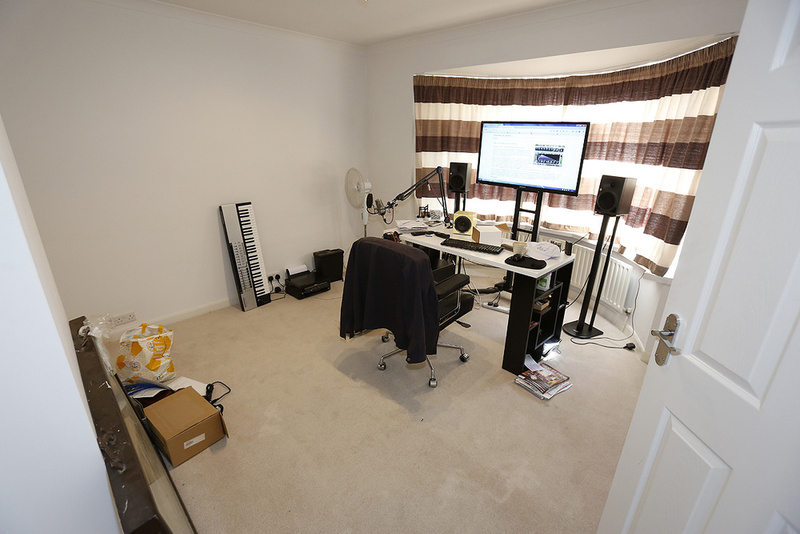 Eddie had this to say about his studio makeover: “Thanks to the guys’ swift work, I’m now able to get back to working on Samplecraze.com. 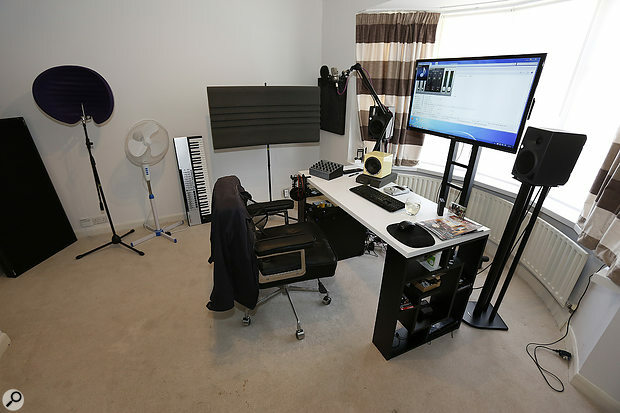 The importance of a treated room can’t be underestimated: I spend long hours creating video tutorials on all sorts of audio subjects, and having a controlled space for voiceover work can make the difference between an amateur and a professional product. I’m in the process of creating some really in-depth online courses too, so this emergency SOS visit has made a massive difference. When you’re writing on topics such as low-end management, pink-noise reference mixing, advanced reverb tricks etc, you can’t afford to have the room deceiving your ears! Using case studies to illustrate common problems, this 306-page book brings together a wide range of real solutions that are both affordable and easy to implement. Written by Paul White, Hugh Robjohns and Dave Lockwood, the SOS team impart easy-to-understand, organised troubleshooting advice on a range of topics. Learn how to rid yourself of monitoring problems so you can accurately hear what you’re mixing, how to enhance the sound of your recording space, and how to perfect your instrumental and vocal recordings. Spend less time re-recording and mixing, simply by improving your room with advice from the guys who have seen it all when it comes to make-do small studios.